Music is amazing when you are working on it, but it is so much more rewarding when you know that there are people who can simply appreciate all the longs hours you put into practicing. Flutist Karen Baumgartner (Show 250), A From the Top Jack Kent Cooke Young Artist, believes that “music has the power to bring people into a story and draw them into a performance”. It was this very belief that inspired her to visit the residents of the Johana Shores Assisted Living Community – a group of people who otherwise have limited access to live concert experiences. In addition to meeting some lovely new people, Karen gained an even broader view of what it means to be a musician. FTT: What made this visit memorable? Karen: I absolutely loved connecting with the residents and staff in the nursing home. I got to the nursing home a little early and was able to play some card games with a few people there. It was fun to tell them that I was going to be performing, and to then see how much they enjoyed the music. Everyone was so appreciative to have me play and were all very engaged. FTT: Did you learn anything new from the experience? Karen: It made me love being a performer even more than I did before, and made me realize how much people can appreciate music. It was fun to play at such a close and personal level because I got to hear feedback after every piece. At a formal recital, you hear the applause but don’t get to hear people’s comments and questions . . . at the nursing home, so many of the people were interested, and I was happy to talk to them about my musical background and plans. It’s easy to get caught up in the routine of performing and hearing the applause but it was nice to have the routine shaken up for a change and get positive feedback right when the piece was done. 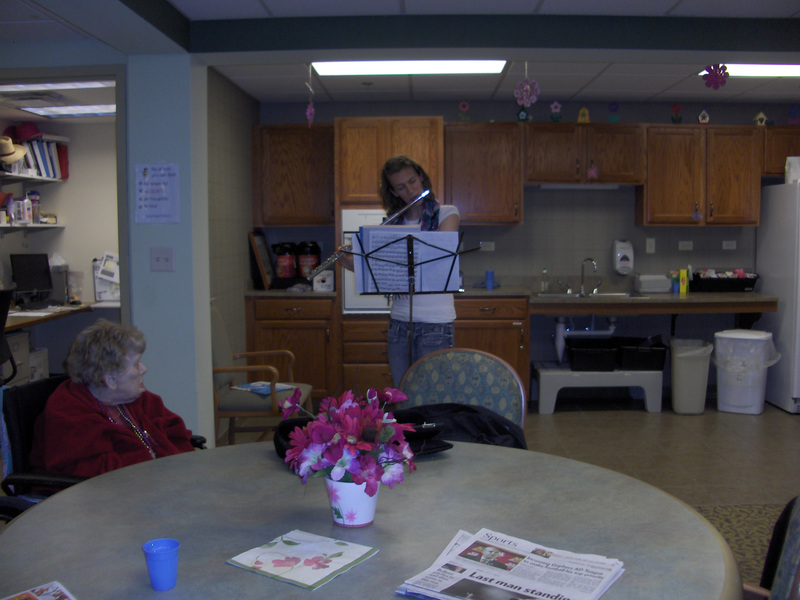 Playing in the nursing home made me remember that the reason I can hope to make a career out of music is because there are people who love to listen to classical music just as much as I love to perform it. FTT: Were there any surprises? Karen: After one of the pieces I performed, I was able to talk about my amazing opportunity to appear on From the Top and play at Carnegie Hall. I expected most people to know what Carnegie Hall was, but it was fun to see some of the people perk up and talk about how they listen to From the Top. I also talked about my performances on Minnesota Public Radio, and found out that the residents listen to it everyday at lunch. I wasn’t expecting to be able to help them connect something they hear on the radio to someone they can see in real life; I was happy that I could be that connection. FTT: What does being an “arts leader” mean to you? Karen: It means that I will make an effort that isn’t always the easy choice, such as performing in classrooms at a school, or trying to get my friends to understand what I love about classical music so much! Being an arts leader means that instead of focusing on myself and being a better player all the time, I will focus on sharing my talent and the impact it has on others around me. I will not just show off my talent at recitals and performances, but will try to connect with people and help them see why music is so important to me.